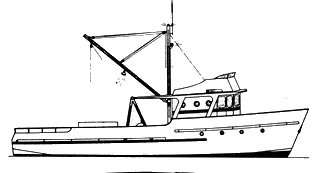 The Gallant 55 is the ideal choice in design for trawling deep waters off shore such as the Australian Continental Shelf, etc. 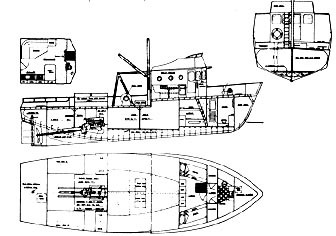 She could also be considered a combination vessel adaptable to working other methods of fishing at different seasons with a crew of three to five, depending on requirements. There is permanent accommodation in the fo'c'sle for four, along with good stowage and toilet facilities. The large deckhouse has a spacious cooking and dining area. Included also is helmsman's position with controls and chart table. 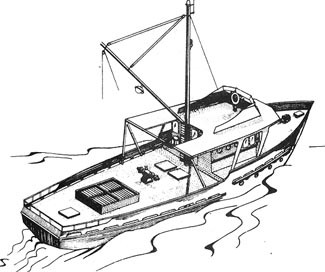 Flybridge with secondary controls is optional but considered a necessity by the modern fisherman of today. The 1200 cu ft hold could be insulated to keep the catch preserved in good condition for market. Placement of the engine aft means a great saving in shafting and sterngear costs and allows for easier removal of the motor. For power, a 300bhp is shown on the drawings, and other motors such as the following would be ideal: Fiat 821 m 260 rated hp, Deutz 230shp, Detroit 8V71 N 230shp, giving speeds around 10 knots approx. 420bhp should give an estimated 13 knots. Construction is chine with flat bar frames and approx. 18 tons of steel required. The plans include large scale sheet drawings with full construction details, lines, offsets, materials list and specifications, etc. Plans & Patterns Only $99, Was $495.